Interest rates have been going up and as a result, the Real Estate market is changing. With mortgage rates at their highest point since 2011, buyers are cautious about jumping into the market. This means that the longer you wait, the harder it may become to sell your current home when you decide you are ready to make a move, whether it’s simply to downsize or make the move to a retirement community. If you are considering retirement communities like Kendal-Crosslands, now may be the perfect time to make your move. Did you know that Kendal-Crosslands residents are moving in at younger ages? While you might assume a retirement community like ours is something only for people well into their 70’s, we accept residents as young as 65. Some of our younger residents are still working and consulting, and they love the maintenance-free lifestyle we offer, giving them more time to do what they want- whether that’s work or play! When we saw the last economic downturn around 2008, our residents were happy to have made a decision that guaranteed them the retirement and life care they planned for, with the certainty provided by our longevity, experience and financial stability. For over 40 years, Kendal-Crosslands Communities has had an exception record for financial management, and our residents have never had to be concerned about their care. Whether you’re considering Kendal-Crosslands Communities or other retirement living options, you need to make sure your community is financially sound for the long term. We have a list of questions you should ask, so can can be assured the Community has a healthy future- just like yours. 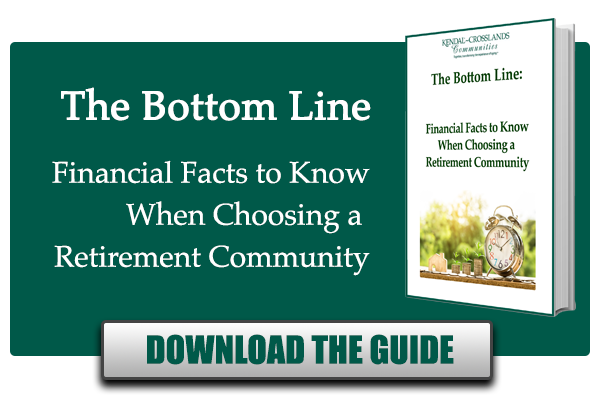 Does the Community Have an Actuarial Report? A CCRC should conduct financial evaluations through an actuarial report to ensure pricing is appropriate to ensure that future needs of residents are met, along with the overall success of the community. 2. What is the Actuarial Funded Status? While an actuarial report can provide a lot of information about the financial health of the community, the most important indicator is the actuarial funded status. This status represents the portion of liabilities (future expenses) covered by assets (future monthly fees and reserves). A funded status should be greater than 100%. 3. What is the Occupancy Rate? Occupancy levels fluctuate based upon transitions within the community, from independent to assisted living to skilled nursing. However, the main goal for any community should be to be full and stay full. Occupancy rates may also vary on the size of the available living options so be sure to ask detailed questions. For example, in Kendal-Crosslands communities, we have a long waiting list for our larger cottages, but have some availability in our smaller inventory. 4. What is the Operating Ratio? Operating ratio looks at the cash flow generated by operations. 5. Do you have a Cash Flow Statement? The cash flow statement shows how much cash is produced from entrance fees, how much cash is used by operations and how much cash is needed for debt service and capital spending. A CCRC should be able to provide you with these documents to help you determine their overall fiscal health. 6. What Debt Are They Carrying? A community’s cash and investment to debt ratio is often determined by the age of the community. A ratio of more than 100% is desirable. Ask for the financial audit, including the balance sheet, which shows how much cash and investments are available, and the organization’s net available assets. The industry uses specific ratios within profitability, liquidity and capital structure to measure the overall financial health of communities. 9. Is The Community Accredited by CARF-CCAC? CARF-CCAC looks at more than 800 standards, with a full section specifically focused on finances as part of their accreditation and certification process. Of the almost 2,000 life plan/life care communities in the United States, under 300 are accredited. While many communities will be licensed under State law, certification and accreditation are voluntary. Certification is required to receive medicare and medicaid funding, but accreditation is an extra level of evaluations and inspections to ensure the community is up to standards. We are very proud that Kendal-Crosslands Communities are CARF Certified. When the economy is uncertain, real estate prices could fall again, and then your retirement plans could be put on hold for years. In fact, Kendal-Crosslands Communities started a program back in 2008 to allow residents to defer their entrance fee payment for up to a year, and we offer $5,000 to help towards qualified moving expenses, including Senior Move Managers and people that can help you stage and sell your home. These programs have made it easier for many of our residents to make the choice to move to Kendal-Crosslands. They also have been able to reduce the stress and worry of a changing economy, while enjoying the retirement and security they’ve longed for. 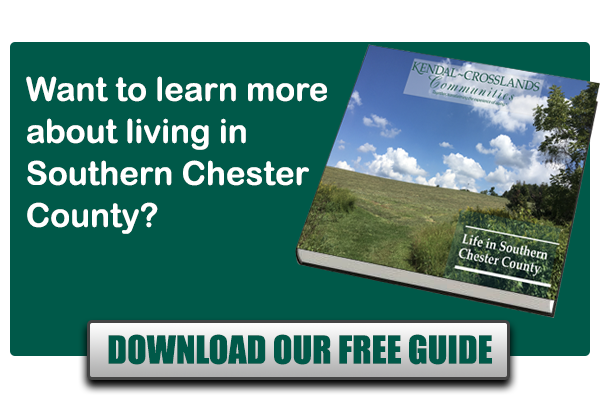 If you’re considering independent living communities, come see what we have to offer at Kendal-Crosslands Communities. Sitting on 500 acres in the heart of the Brandywine Valley, we offer an unparalleled experience in transforming the experience of aging.